Yesterday we were sad to learn of the loss of Ernie McLean, the legendary guitar player who performed at Disneyland park for more than 30 years. 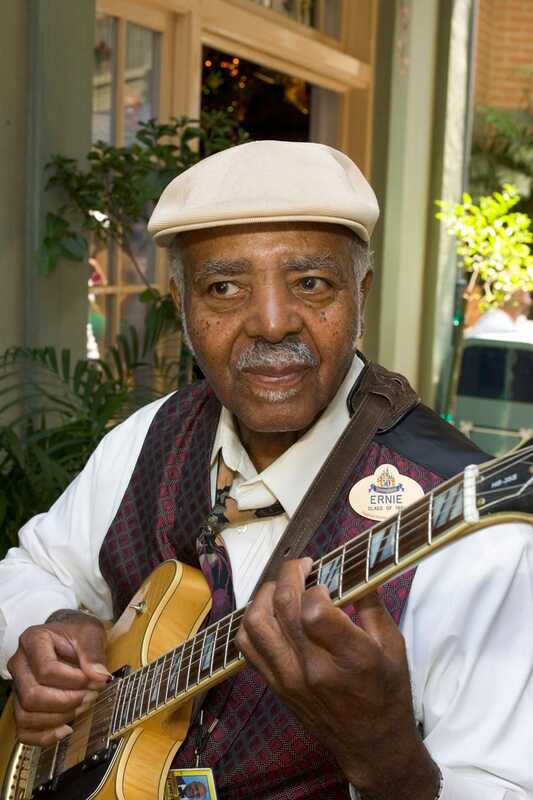 Known for his warm smile and amazing jazz guitar, Ernie was an original member of the Royal Street Bachelors – now a guest favorite in New Orleans Square. The best person to tell Ernie’s story is Ernie himself. Below is a recent interview with the man Disneyland guests would often see sitting on a wooden stool just outside Pirates of the Caribbean, playing jazz tunes on his guitar. My father taught me how to play the guitar. I started playing at the age of 11, but don’t ask me what I was playing back then because I couldn’t tell you. My father had a job playing in a government concert band in New Orleans. They told him the banjo player needed to double on guitar. When he started to learn the guitar he taught me too. Did you continue your musical training after high school? After high school, my father said, “Look you’re not gonna be running around like you’re crazy, this is World War II.” So I joined the Navy. When I auditioned for their band, they put music in front of me to audition and I messed it up something terrible. Then they told me I did okay. They taught me everything I needed to know about music. I played for four-and-a-half years in the Navy. What did you do after your military service? After I got out of the service, I decided I wanted to continue playing music for a living. When I played with Dave Bartholomew things really took off. We recorded with Fats Domino, Nancy Wilson, Little Richard, Sonny and Cher, and even did Chrysler commercials. 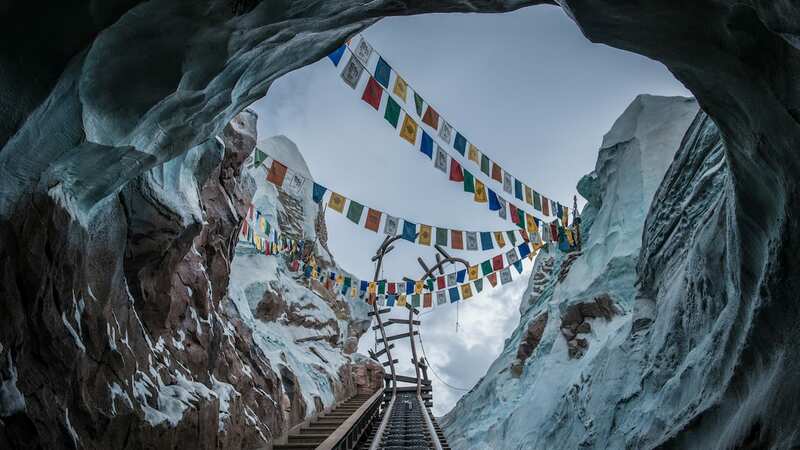 How did you end up working at the Disneyland Resort? I auditioned as a guitar player for a tour. I didn’t think I was going to get the job. Then they started to talk about rehearsals and going to the studio, so I stopped them and said, “You haven’t offered me the job,” and they replied, “Why do you think we are telling you this if you didn’t get the job?” Once the tour ended, [Walt] Disney eventually called me to sub for the banjo player at Disneyland. That is when I became permanent at Disneyland. We will miss Ernie and the joy that his talent brought to millions of guests in one of the most unique locations in any Disney park. A sad day for sure. As a musician I will miss his talent and skills. As a frequent park visitor I was already missing him in New Orleans Square. This just makes it a reality that we will never hear such a wonderful example of a player, but also we will never have the extraordinary example of the top notch, classy person that he was, there to great us. Theanks for the memories Ernie! Thanks for sharing with us his story. He brought much joy and will be missed. What a sad day for Disneyland. Sending happy thoughts to his family and friends. Did Ernie ever play inside the Blue Bayou as well? Love the Royal St. Bachelors. Sipping a mint julep and listening to them play is the best rest spot at Disneyland. So sad! I always made it a point to stop by and say hi to Ernie! If you get a chance to go to Club 33 there is a paintng of Ernie as you go up the stairs. Sad to hear. Ernie was a New Orleans Square staple, I will definitely miss his unique sound next time I’m at the park. Thank you, Ernie….you are the part of the memories of my family and so many others. We have several videos of Ernie. My husband is a guitar player and always loved to stop and hear him play. I hope that his family takes comfort in his legacy of joy. The last cast member personally hired by Walt Disney. A sad day. I’ll miss sitting on that bench listening to him play. Much love to Ernie’s family & fellow cast members. Ernie you will be missed. I’m so sad to hear about Ernie passing. I literally saw the post and said, “Noooooo!” I’ve been looking for him the past couple of years and was disappointed to see that his cabinet that held his amplifier was no longer there. He was a great guitar player, I’m glad I got to see him in action. You can look him up online for videos of him playing, it’s a great way to remember him. This makes me sad. I enjoyed listening to him play while working in New Orleans Square. He was the highlight of my day. I was so sadden to hear this today. I still remember stumbling upon Ernie while resting on a bench in New Orleans Square. That fifteen minutes I sat there people watching I was in awe of his talent. I’ve been reading up on his life today and happy to say that I got to witness a legend. There may be a empty spot that he once played but his wonderful music will still live on. Thank you Ernie! I only had the privilege of seeing Ernie once, but I’d heard stories about him before and since. He sounded like a remarkable man, and a remarkable Cast Member. I’m sure he will be missed, and my sympathies go out to his friends and family. I sincerely hope Disneyland is planning a tribute to him. In my opinion, nothing would be more fit than for Ernie to be memorialized with a Window in New Orleans Square (much like Fess Parker was given a Window in Frontierland). RIP, I’ve had many conversations with these gentlemen, love them! I even wrote about them in my book about what a pleasure they are to help find peaceful moments and places in DL. It is our loss. RIP, Ernie. We’ll miss your wonderful guitar at Disneyland, but know that you’re now playing for Walt and Lillian in that big Theme Park in the sky. So sorry to hear that. I have been fortunate enough to talk with him a few times and enjoyed his playing. He was a real talent. I heard that he had performed at Disneyland since 1966 and that he was 87 years old. Ernie will be missed. I remember being at Disneyland for my birthday & wearing my birthday button. I was sitting on a bench in New Orleans Square, waiting for the rest of my party. Ernie saw me sitting there, and segued into a jazz rendition of Happy Birthday. He will be missed — he made quite the impression on me, and countless others. My condolences to his family and fellow cast members.. He will be sorely missed. We always enjoyed stopping and listening to him play his guitar when we visited. I love the fact that you guys remember your Disney family, it makes it even more special when going to Disneyland. It makes it feel like your going to someones home. so sad, I’ve seen him play at the Park. 🙁 He’ll still be playing in that fancy park in the sky..